The blue skies, the appearance of flowers in front of our school, and the songs of the birds in trees remind us of the arrival of spring. We have spent so much time indoors that the children are excited to visit the playground again. The children strengthen growing muscles when climbing, running and playing outside. 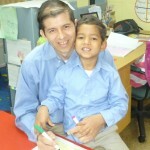 As educators and parents, we observe the children blossoming at this time in the preschool year. During our conferences, teachers shared examples of documentation affirming the children’s tremendous growth since September. Developmentally, children often take leaps forward and steps backward–and sometimes a period of calm as children pause and readjust to their own new abilities and perspectives. It can be challenging for us, as adults, to understand these shifts in children’s behavior. 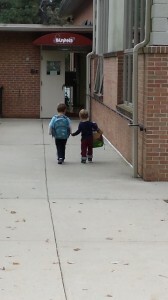 Just as it appears that separation anxiety is no longer an issue, a child “suddenly” doesn’t want to come to school. This is all typical behavior for preschoolers. With patience and encouragement children gain the confidence needed to overcome anxious feelings. 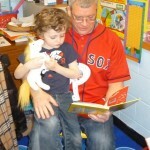 Thank you to the parents and Grandfathers who joined their children for very special Donuts with Dad morning. The children were full of smiles and pride walking their parent into BUMNS. The children proudly showed off their classrooms and introduced friends. 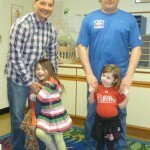 The children and their dads created special art projects together. The projects are keepsakes to preserve the memory of Donuts with Dad Day. I loved reading the children’s responses to the question, “Why is your dad special?” Some answers included, “He holds me up to shoot hoops!” or “He helps me make breakfast for Mommy.” Donuts with Dad Day will remain a special event in your child’s preschool experience. On Weds. May7th BUMNS will host our annual Dinner and Silent Auction at Alfredo’s in Berwyn. Doors open at 6:30. Come early to view the Silent Auction offerings. The BUMNS Parent/Teacher board has spent weeks planning, soliciting items, and bundling auction items. Class projects have been created by each class for auction. We are looking forward to a fun evening. This is BUMNS largest fundraiser. Monies raised benefit the children of our school. 1. Expect more. At school we expect the children to hang up their coats, put Game Room games back in the proper “home”, or throw away their trash after snack (just to name a few “chores”). Children love feeling independent. Today I watched the 2 Day children throw their cup and napkin in the trash after snack time. Each child completed the simple task. Expect them to do more and most often they will. 2. Resist doing for your child what they can do for themselves. It is quicker and easier for you to do it. Whenever you are trying to get your children to dress, put jackets on, etc., ask them if they want help or can they do it themselves? Suggesting your child complete a task without assistance is like magic. Kids always want to do it for themselves! Watch how the children walk proudly into school. They want to do it themselves! Often they will wave my hand away when offered. 3. Don’t redo what they’ve done. Unless absolutely necessary, don’t fix what your child accomplishes. If she dresses in stripe and polka dots, compliment her. As teachers we don’t “fix” art projects the children have created. I love pictures with crooked smiles. The projects are self-directed and a unique creation of the child. The child feels a sense of accomplishment completing the art activity. 4. Let them solve simple problems. Pause before rushing to help your child assemble a toy or get a book from a shelf. We cheat a child the experience of success if we try to make everything perfect. In the Game Room, the children often use discriminating skills to complete assigned games. They are problem-solving. 5. Assign a chore. Assigning a regular, simple task will build your child’s confidence. The goal is to make your child feel like they are contributing to the family. The children at BUMNS are assigned weekly jobs. They love the feeling of independence as the mail person, line leader, snack person, flag holder; such simple tasks that make the children feel good about themselves. BUMNS added a 4 Day class this year. Enrollment opened and the first twelve to register were guaranteed a place in the class. We did not anticipate that the first eleven to enroll would be boys. Fair is fair. We would have a class of boys in 4 Day. The lone girl to register moved up to 5 Day. The twelfth spot filled quickly with one more boy. Mrs. Harris and I can attest that the assumptions were wrong and our class of twelve boys is a wonder to behold. I love walking by the class and poking my head in the door. There is a quiet hum to their busy activity, not a loud roar. I have seen compassion and empathy among friends. All is forgiven if social altercations occur. Story time is my favorite time to visit. The boys gather around the carpet and listen intently as Mrs. Harris reads to them. Their faces light up and I can only imagine they are going on an adventure through literature into the land of make-believe. The most effective way to teach a class of boys is to take advantage of their energy, curiosity and thirst for competition. Our 4 Day classroom is active and lively. The boys remain interested and engaged. There are many hands-on activities. At times they venture outside for a lesson. It was fun observing this year’s class of boys! The class has dispelled all rumors of chaos and disorder. I am proud to say that Mrs. Harris’ twelve boys are curious, attentive, and engaging. They love coming to school. The boys are proud of accomplishments and strive hard to complete assigned tasks. I love our class of boys! Applications are being accepted for BUMNS January 2 Day Class. Children must turn 2 by January 1 to be eligible for the class. Register now by emailing: director@bumns.org or calling 610-296-2246. 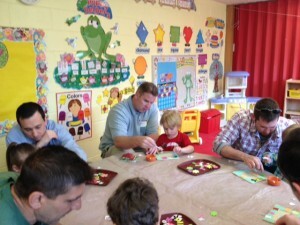 Thank you to the Dad’s and Grandfather’s who joined their children for a very special Donuts with Dad morning. The children were full of smiles and pride walking their Dad’s into BUMNS. I was introduced to the Dad’s or Grandfather’s as they passed me on the sidewalk. 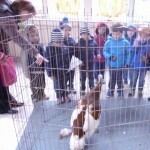 The children proudly showed off their classrooms and introduced friends. 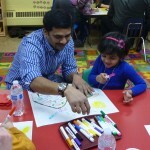 The children and their dads created special art projects together. The projects are keepsakes to preserve the memory of Donuts with Dad Day. I loved reading the children’s responses to the question, “Why is your dad special?” Some answers included, “He holds me up to shoot hoops!” or “He helps me make breakfast for Mommy.” Donuts with Dad Day will remain a special event in your child’s preschool experience. The 5 Day classes are looking forward to BUMNS annual Muffins with Mom and Musicale. The event will be held on Friday, May 10th. The children will perform a variety of songs under the direction of Mrs. Debbie Brown, in the church chapel. Following the performance, the children and mothers will return to their classrooms for muffins. In light of the recent events, supporting our local Fire Department becomes so relevant. Volunteer firefighters and police are an important component of our community. The men and women who serve provide us protection. Mr. Rogers’ advice to children is “to look for the helpers. You will always find people who are helping.” BUMNS is collecting pennies to donate to the Berwyn Fire Company. The pennies will buy a brick engraved with the BUMNS name to be placed on the Fire Station property. On Weds. April 24th BUMNS will host our annual dinner and Silent Auction at Alfredo’s in Berwyn. Doors open at 6:30. Come early to view the Silent Auction offerings. The BUMNS Parent/Teacher board has spent weeks planning, soliciting items, and bundling auction items. Class projects have been created by each class for auction. We are looking forward to a fun evening. This is BUMNS largest fundraiser. All monies raised benefit the children of the school. 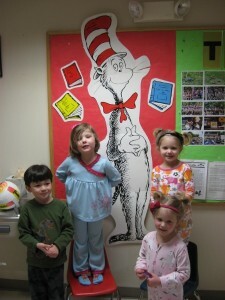 Continue reading Happy Birthday Dr. Seuss! Registrations are now being accepted for the 2012-2013 school year. To schedule a tour, call 610-296-2246 or email: director@bumns.org. Thank you to the parents of BUMNS for participating in our fundraisers. Your generous donations enable us to make improvements that benefit the children of BUMNS. Thank you also to Kevin Howell! Kevin not only designed and built our playground gate, but he created wooden letters to officially name our boat the USS BUMNS.